The journey to Naga City via the eastern corridor from Quezon City to Rizal and the eastern towns of Laguna eventually led us to Quezon. 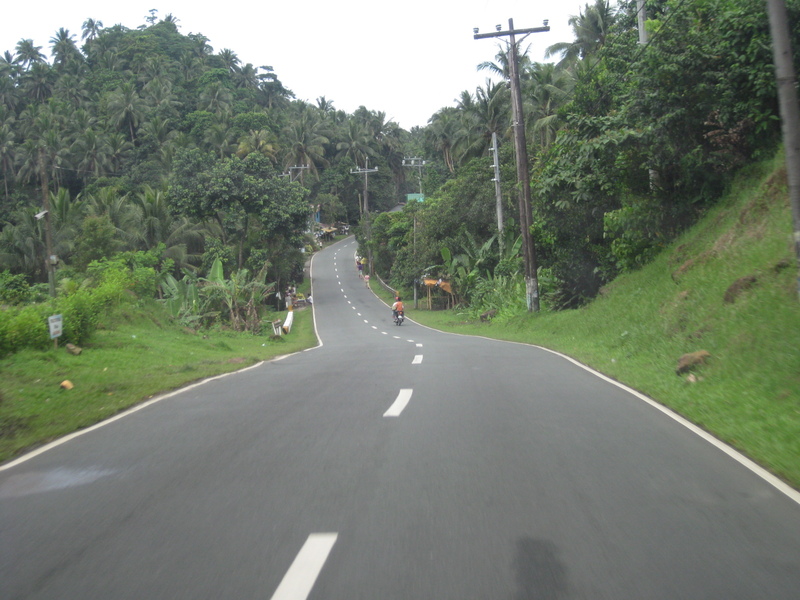 For this post, I will feature mainly photos of roads in Lucban and will reserve shots of Tayabas, Lucena and the coastal roads of southeastern Quezon in future posts. 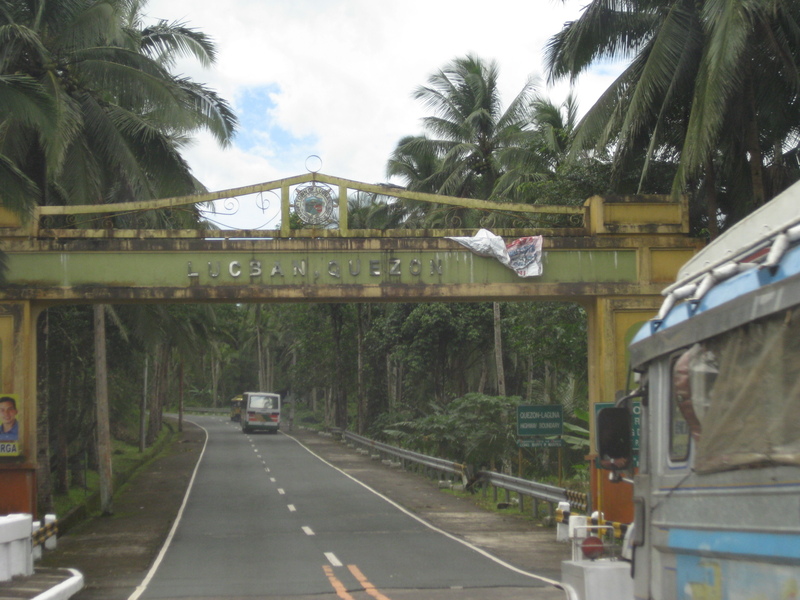 Arch welcoming travelers to Lucban – the structure is quite simple compared to other arches I’ve seen along national roads. 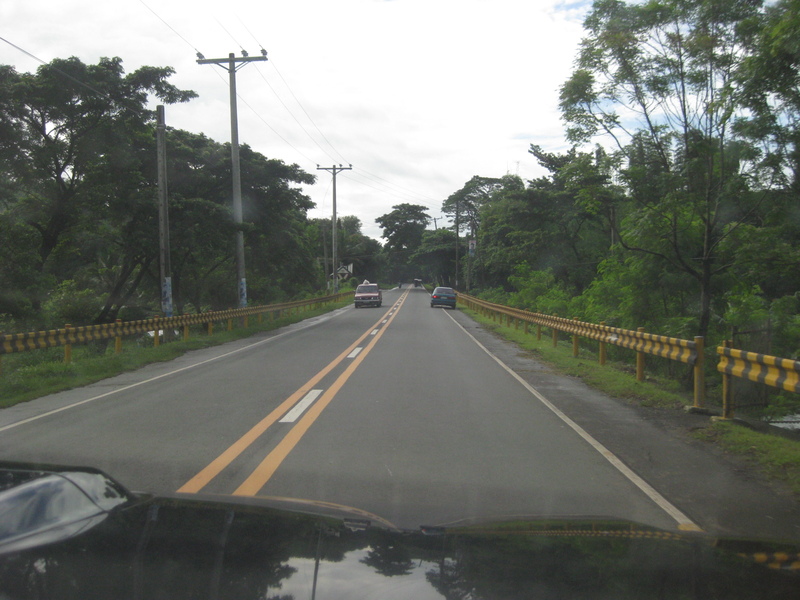 The section from Luisiana to Lucban also features good pavement complemented by standard signs and markings. The scenery is also nice with the highway being tree-lined and you can open you windows to take a breath of cool fresh air. 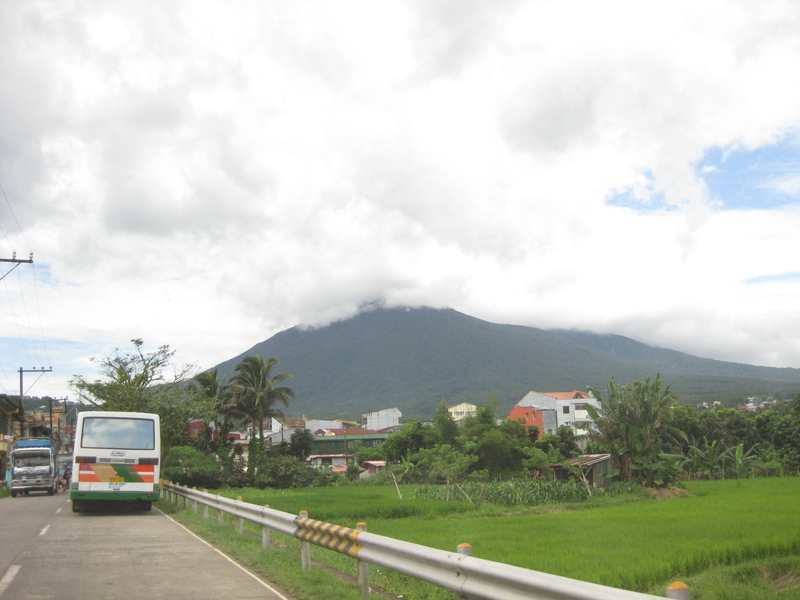 Section leading to Lucban town proper has a good view of Mt. Banahaw. The mountain is famous for its mystical reputation. It is also well-known for being the headquarters of the New People’s Army’s Banahaw command. Another view of Mt. 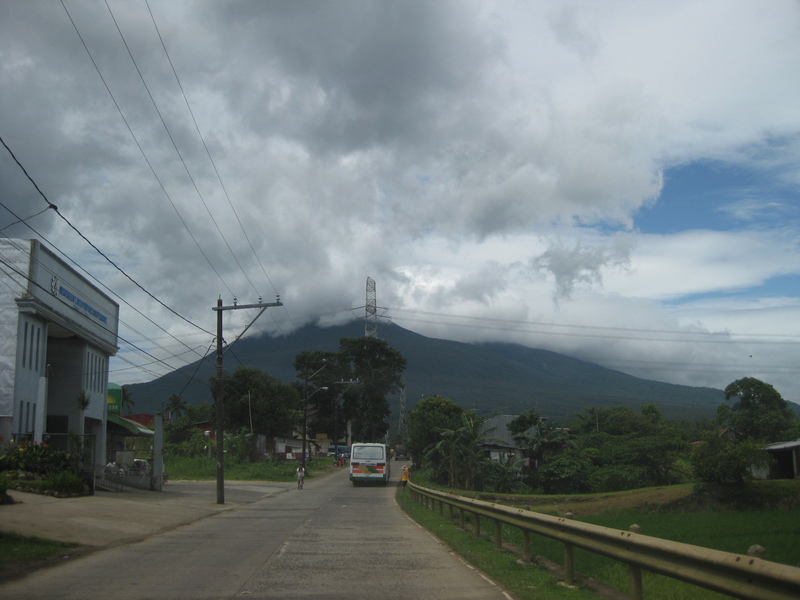 Banahaw from the national highway with a view of the countryside. 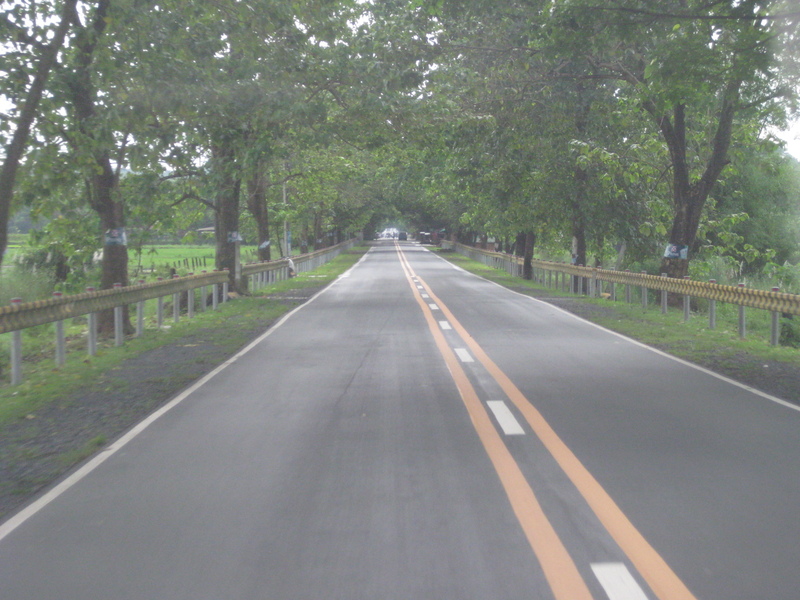 Most towns along this stretch of the national highway are dependent on agriculture. 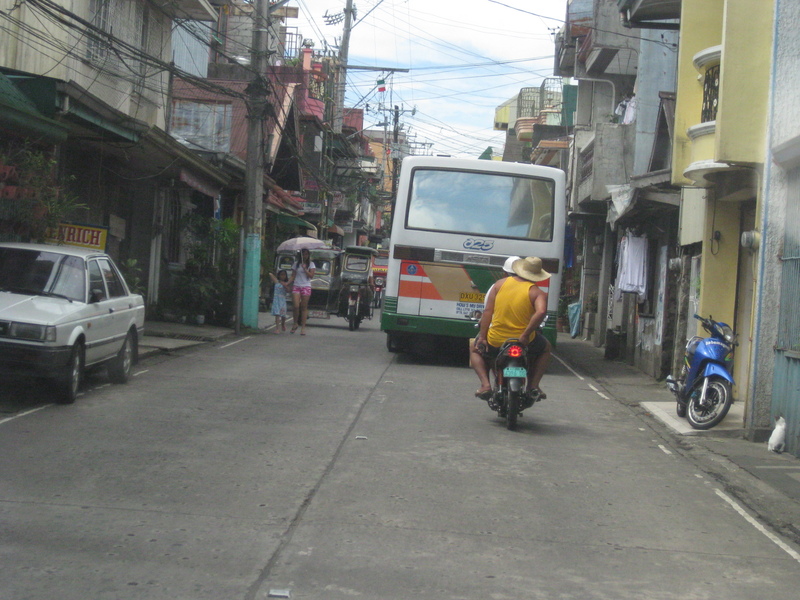 This narrow street is actually part of the national road that’s well within Lucban town proper. There are no sidewalks, much on-street parking. 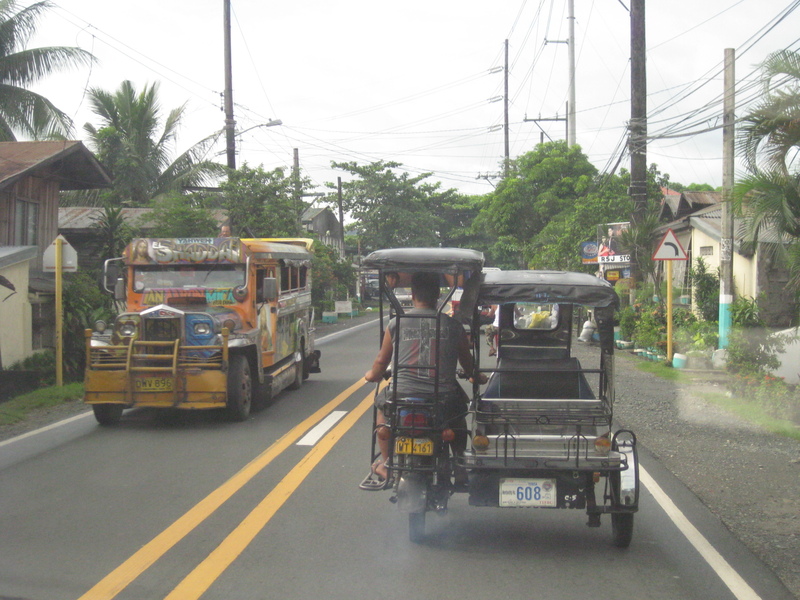 and tricycles and motorcycles actively mingling with through traffic. Notice the bus already encroaching upon the lane for opposing traffic. Note, too, the two pedestrians (one is a child) walking along the carriageway with a tricycle right behind them. 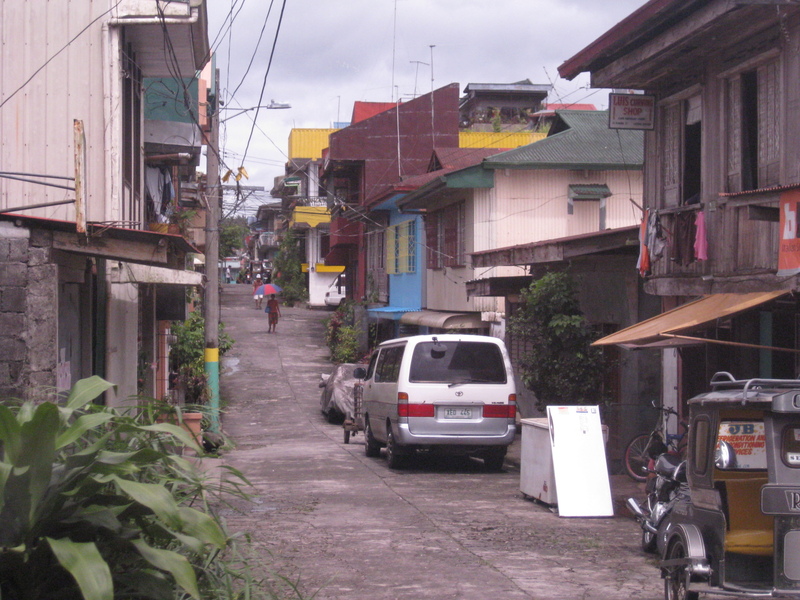 Narrow side street – Lucban is an old town and has many narrow streets that has changed very little in the past years. Since there are no significant traffic and a few have garages, many vehicles are just parked along the roads. 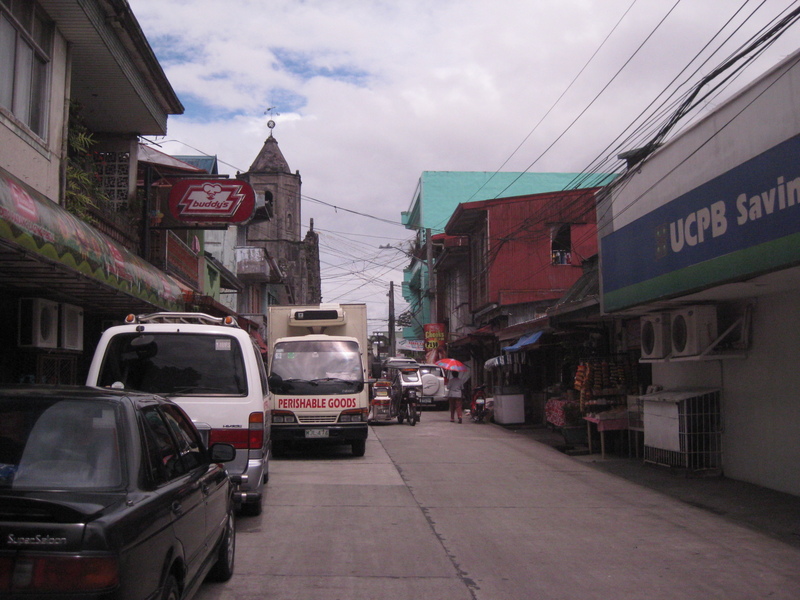 Another side street in Lucban town leading to the old church and plaza. The town is structured similar to most old towns around the Philippines, with the center being the plaza that is surrounded by the church, the municipal hall and the marketplace. 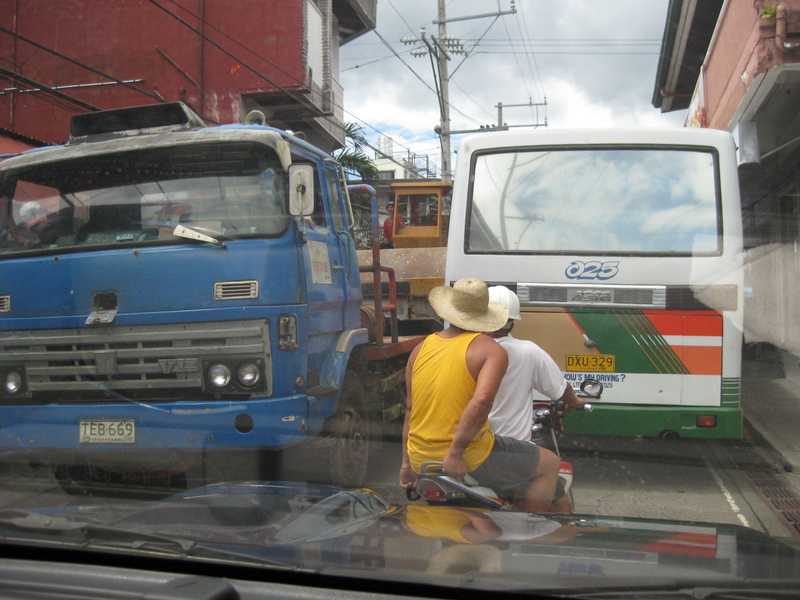 Close call – as if to demonstrate just how narrow the national road was, a truck and bus squeeze slowly past each other. 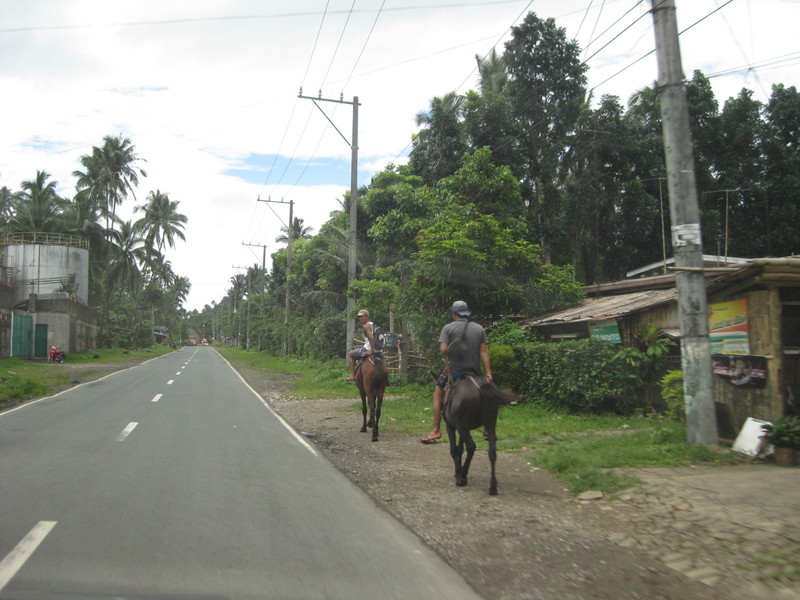 After exiting the town proper, the traveler is again treated to rural scenes like farmers on horseback. While roads are generally of good condition, shoulders are practically just clear spaces along the roadside. Often, there are structures such as houses encroaching upon the ROW. 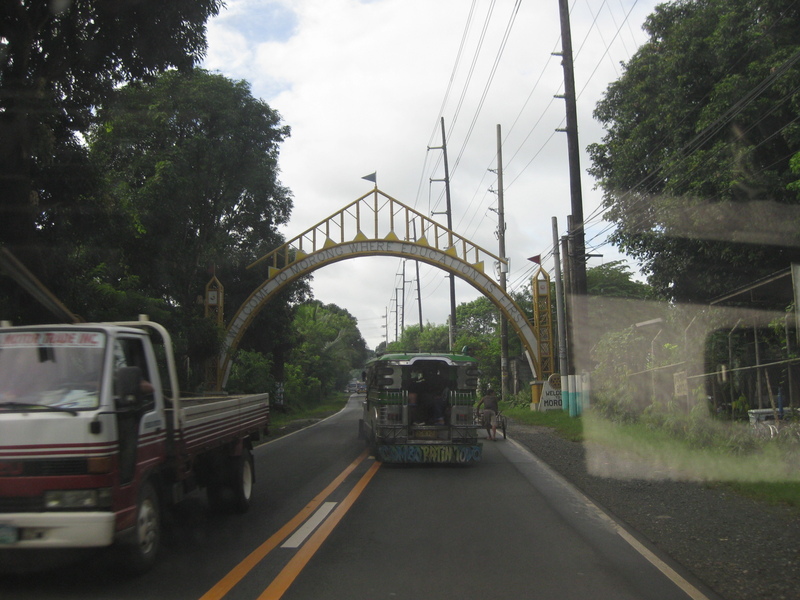 Many road sections between Lucban and Tayabas are on rolling terrain. This necessitates combinations of horizontal and vertical curves that can be quite hazardous to speeding motorists. Note that there are no shoulders and signs are usually lacking or obscured. I’ve written about land use and parking along Katipunan Avenue, which is part of Metro Manila’s Circumferential Road 5. Katipunan extends southwards to Blue Ridge, St. Ignatius and White Plains (the latter subdivisions just across the street from Camp Aguinaldo) where there are also many establishments along either side of the road. Most of these establishments are restaurants that attract significant private vehicle traffic. Note that there are no public transport routes along Katipunan/C5 in the Blue Ridge, St. Ignatius and White Plains areas. As such, establishments are more likely to attract people with cars rather than those taking public utility vehicles. Many of these establishments are on lots formerly occupied by residential buildings (i.e., houses) considering the predominant land use in the areas. These were eventually purchased and converted for commercial use, resulting in layouts that generally do not include adequate parking spaces. The consequence of shortcomings in parking have been the propensity for on-street parking such as shown in the following photo in the Blue Ridge area. 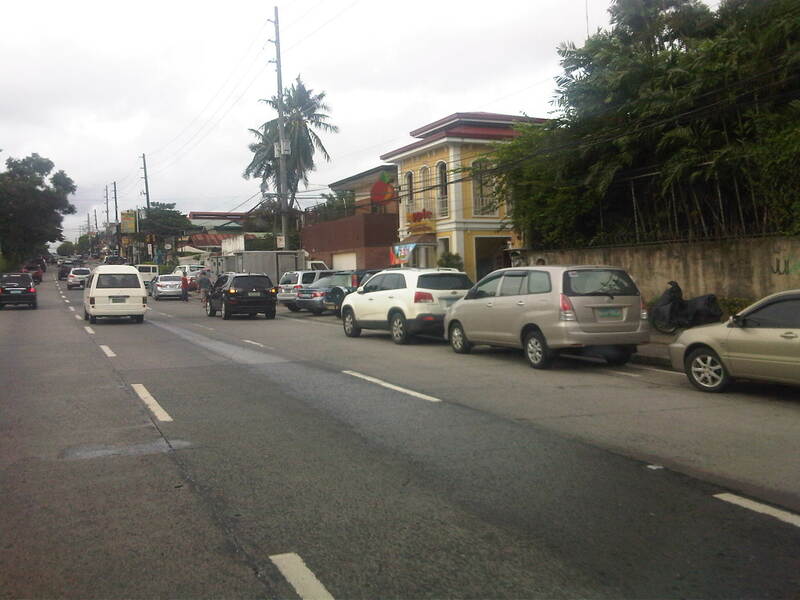 On-street parking for a popular restaurant/cafe along Katipunan/C5 at Blue Ridge. Such case and many others like it along Katipunan (and other Metro Manila or Philippine cities roads) are the result of both poor planning and lax enforcement of traffic rules and regulations in this country. Being a primary arterial, Katipunan/C5 should be clear of such unnecessary sources of roadside friction that effectively decreases road capacities while also increasing the risk of crashes as vehicles maneuver, or in some cases wrestle, for parking spaces. The outbound approach to the bridge along Marcos Highway was quite congested this morning due to the closure of the underpass leading to C5 located just in front of SM City Marikina. 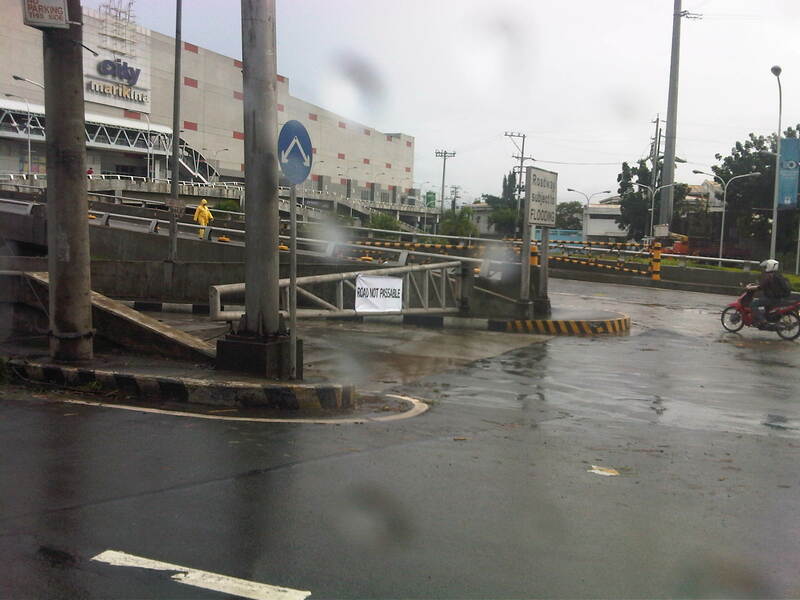 The section was closed to traffic due to flooding caused by Typhoon Pedring (International name: Nesat). 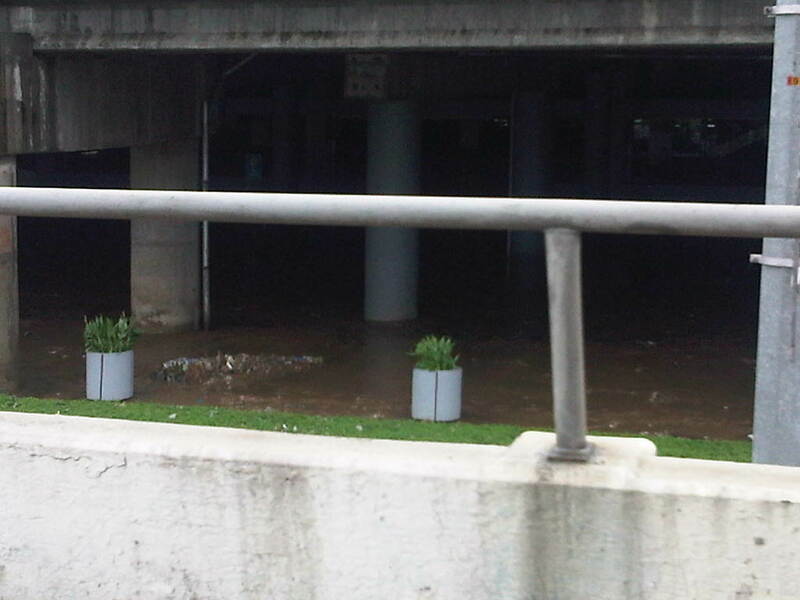 Pedring’s rains caused the Marikina River to swell up and inundate significant areas along its banks including what looked like the lower level parking area of the mall. Traffic bound for C5 from Marikina, Pasig and the towns of Rizal had to be diverted to the Riverbanks road via the service road after the bridge. The result was traffic congestion as 6 lanes of traffic tried to squeeze into what was effectively 4 lanes of bridge including the bypass structure fronting SM that eventually merges into 3 lanes of road on the other end. A gate bars access to the underpass connecting to a bridge leading to C5. The sign on the right states: “Roadway subject to FLOODING,” and is a permanent sign placed there to condition the mind of travelers about what may happen should there be inclement weather. This is supposed to be an example of a design where there’s no choice but to sacrifice according to the character of the area. Still, the question on many people’s minds probably is why were other designs that won’t be subject to flooding considered in the first place? Such would surely be worth it considering the frequency our climate and the probability of flooding? 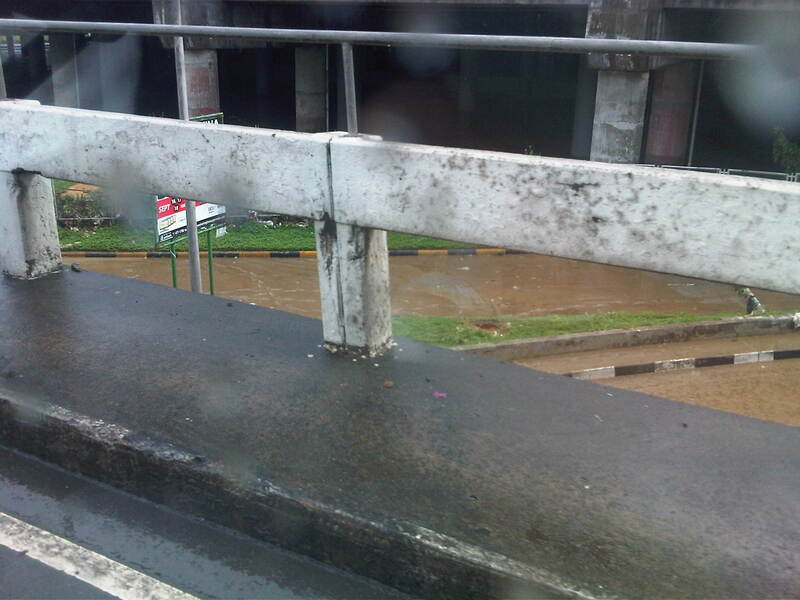 Mud and muddy water on the underpass as seen from the bridge. Such is a scene reminiscent of the aftermath of Ondoy (International name: Ketsana) in 2009, exactly 2 years ago to the day. A peek into SM Marikina’s lower level environs show thick mud that settled on the service road and the mall’s lower parking area. The mall’s design already factored the anticipation of floods brought about by the swelling of the river during powerful typhoons such as Pedring and Ondoy. The mall was, after all, constructed on the flood plain, which is an unusual and uncommon location for such developments. Garbage comprising mainly of plastic trapped on the SM screen fence. These were part of the flotsam and jetsam from the Marikina River. 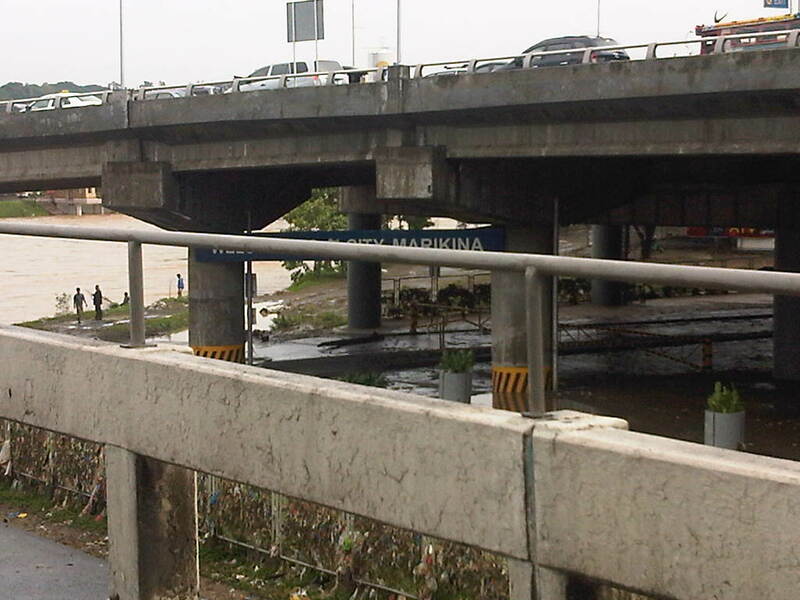 Such debris are evidence of the state of waste disposal and mismanagement in areas along the Marikina River. It is clear that people still have not learned from past experiences and government is partly to blame for this, particularly at the local level. 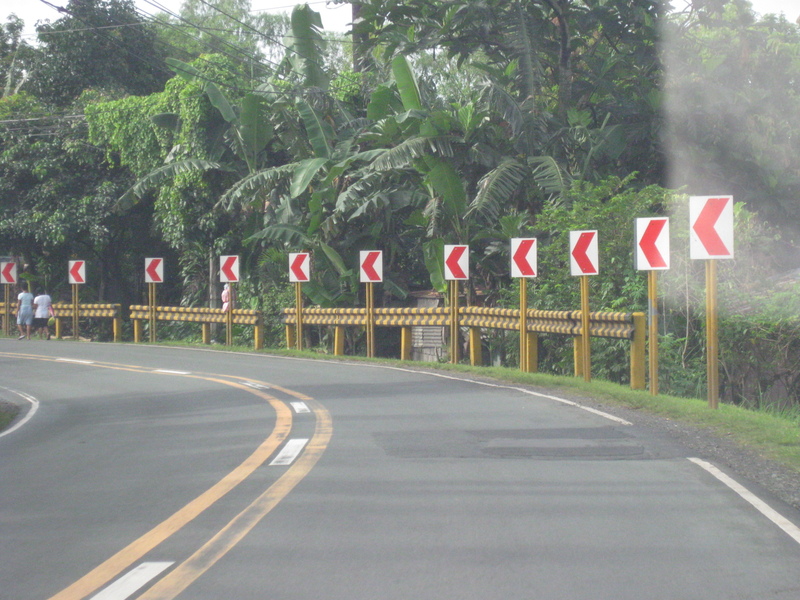 Many sections in Laguna Province also have standard signs and markings but many signs are obscured by foliage and in this photo, banderitas from a past fiesta. 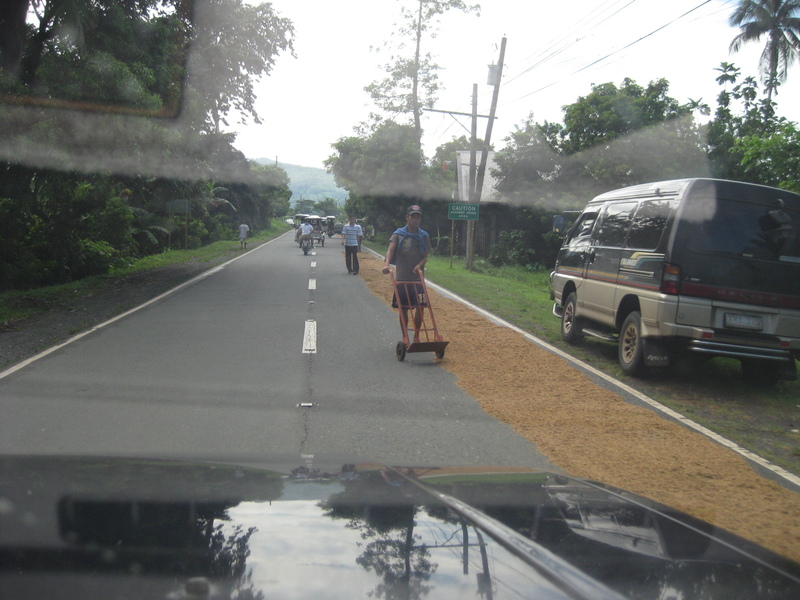 Many sections along populated areas do not have shoulders mainly due to encroachment upon the road right of way. 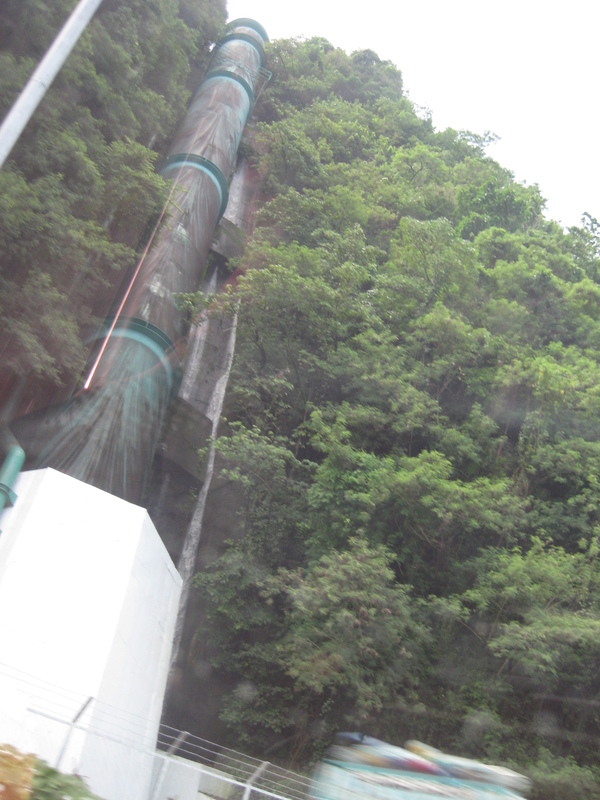 Gigantic pipes leading to the turbines of the Kalayaan Hydro Electric Power Plant – the national highway passes through a section where on one side you have a view of the power plant below and on the other are pipes feeding water from the reservoir above where the elevation produces head for the generation of power downstream. 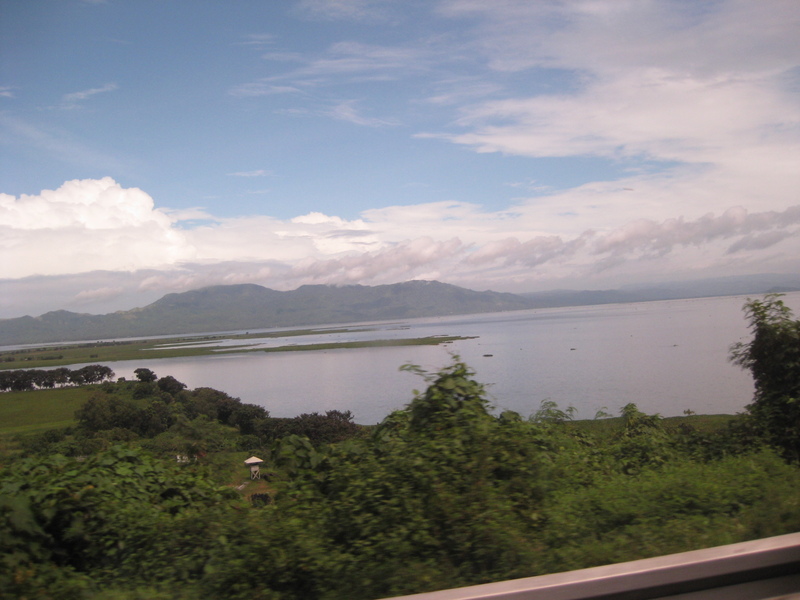 From the national road, one can get a nice view of Laguna De Bai. In some areas, however, the piles of garbage from makeshift dump sites are quite visible and presents the traveler with the sad state of waste management in coastal towns of the province. 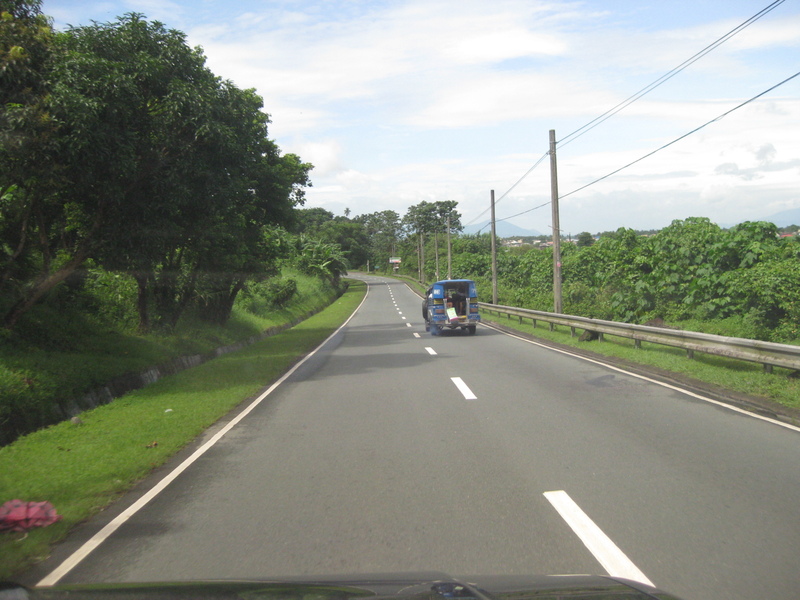 Many sections of national roads in the eastern part of Laguna have excellent pavements with asphalt providing a smooth, comfortable ride. These also have good drainage though I am not sure about lighting/illumination since I have not had the chance to travel along these road at night. 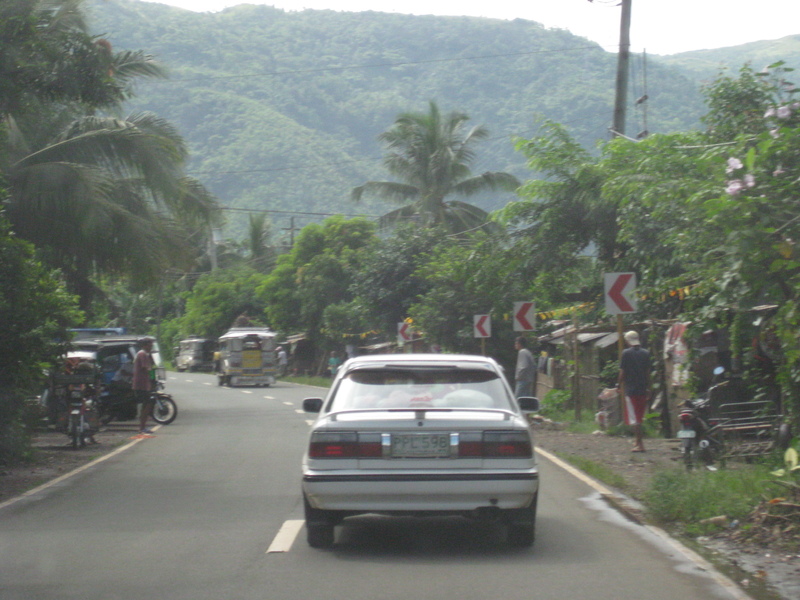 Mountain sections though often do not have shoulders where vehicles may go to in cases of emergencies like breakdowns. 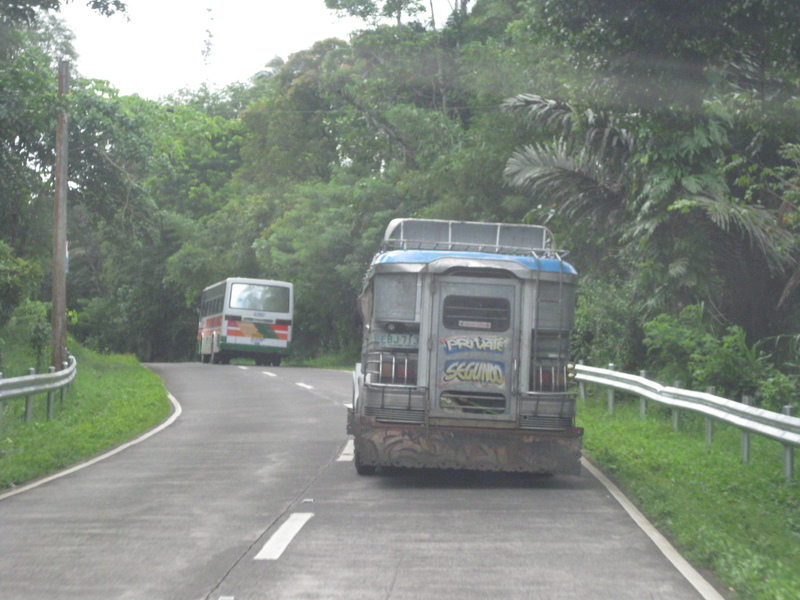 Despite some steep sections where heavy vehicles like trucks and buses may slow down, there are no auxiliary or climbing lanes to allow for passing. The LTFRB recently release lists of bus companies that are in the top ten . Versions of the list may be found in this article from the Philippine Daily Inquirer, The Manila Times, and The Philippine Star. “…The list is broken down into three categories—number of deaths, injuries and property damage—and is based on accident reports submitted by all public utility buses to the LTFRB. The lists published by the LTFRB cover the whole of 2010 and the first half of 2011. “…Topping the LTFRB list is the Victory Liner, Inc. plying routes from Manila to Isabela, Bataan, Zambales and Benguet with 31 accidents from 2009 to 2011; 15 drivers died from these accidents. Fourth in the list, United Land Transit and Bus Company has routes from Quezon, Leyte and Samar with 18 cases of accidents killing four of its drivers. While the reports above mention few statistics, there are actually more detailed information with the LTFRB. Such data have been demanded from them by Congressional committees “investigating” public transport franchising. In one meeting the LTFRB mentioned that it is coordinating with the MMDA in compiling the number of traffic violations for each bus company based on the MMDA’s records. Their preliminary results have shown that bus companies have been involved in thousands of violations! Perhaps these should be proof of the aggressiveness or recklessness of drivers in general? And I dare ask if these can be used to weed out public transport drivers who should have no right conveying the general public? I just wonder what would be the statistics for PUJs, tricycles, trucks and private vehicles. These would be interesting to analyze in order for us to formulate better strategies and tactics for curbing road crash incidence, fatalities and injuries. I wrote about the proposal for a transit system at UP Diliman in a couple of posts where in one I included a figure of what was being put forward as a possible route for a loop at the Diliman campus. 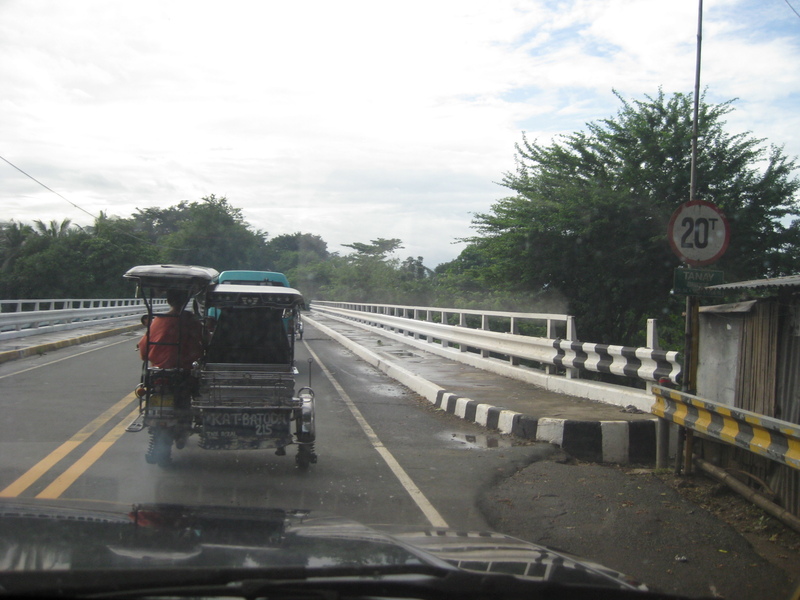 In another post, I included photos of the test track that was constructed at the DOST compound in Bicutan and featured a prototype vehicle that was more of a “confidence builder” than a viable transit vehicle. In the posts, I already articulated that a transit system such as an AGT or a monorail would most likely be not viable for an area like UP Diliman considering the limited demand and the prospect of having high maintenance costs. These are aside from the issues pertaining to social acceptability and other impacts of such a system on the campus. Perhaps an AGT or a monorail would be feasible elsewhere like how they are currently being used in CBDs or airports, where the demand would be enough to at least allow for decent revenues. I’ve read a few articles including one that appeared a few days ago where it seemed to me that the writers were not really knowledgeable of what was going to be the collaboration between UP and DOST in as far as the transit prototype was concerned. Articles have even gone to the extent of saying farewell to the Ikot jeepneys as the primary mode of public transport when going around the campus. All these are mostly theoretical at best considering that perhaps road-based transport is still the best option for UP Diliman. We only need to ensure that such transport will be of the environmentally sustainable kind. Meanwhile, UP’s official statement regarding what will really be constructed at the Diliman campus may be found at the university’s website. It is clear from the statement that a test track will be built and that a prototype will be tested to determine whether local designs actually work. This perhaps will be the basis for determining whether the system can be replicated elsewhere, even considering the prospects of scaling up where such transit may be applicable. Studies will also be able to validate the costs of a system since it is being touted as something that should be less costly than other systems that are already in operation elsewhere (i.e., other countries). For what its worth, a locally developed, cost-effective system will be a welcome option for many Philippine cities that badly need a modern public transport system.